Did you read this shocking headline "170 Million in U.S. Drink Radioactive Tap Water" lately? I am. And you should be, too. No matter what your political opinion is. So, what are our options? I looked into the removal rate for radium by various water filters. If you already know what is in your water and just want to find the best radium water filter, go here. In general, radioactive substances and radiation are not so easy to remove from water, plus radioactivity can build up within some filters. To read more about all options to remove radioactivity from your water including their pro's and con's, keep reading. Which Water Filters Remove Radioactive Contaminants? How to find out if my water contains radium? How does radium end up in my water? Where does it come from? 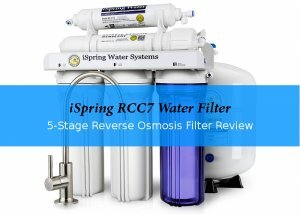 Which water filter techniques work for radium? Well, here is the first problem: Not all water filters work well for all radiological pollutants. While reverse osmosis filters are best to remove uranium or radium, there are less effective against radon and strontium. For these two, activated charcoal filters would be more effective. If you have radon and tritium in your water, it may also not be enough to just filter the water you drink. They pass off as vapor from hot water. As a result, you and your family risk radioactive contamination when you take a hot shower or bath. So let's start with some background information about radium, one of the most common radioactive elements found in drinking water. To get an idea just how common radium is in water supplies, just take a quick look at the map below. Image: Screenshot, EWG's radium map. Radium (Ra) is a chemical element, and is one of the alkaline earth metals. All radium isotopes are radioactive. It was used until the 1960s in luminous paint on watches or switches. Currently, it is still used to treat some forms of cancer. Please do not mistake radium for radon, a radioactive gas, that forms when radium emits alpha-particles. The fastest way to find out if your water contains radium radionuclides is a call to your public water supplier. If that does not work for you, your second option would be a search in the Environmental Working Group's database. As far as I know, there are no water test kits for radium you could do at home. If you happen to know of one, please leave a comment, so we all can save some money on more expensive lab tests. Yes, in the USA the Maximum Contaminant Level (MCL) for the combination of radium-226 and radium-228 is 5 picocuries per liter (pCi/L). MCLs are legally binding levels. Public water suppliers have to take care that the water they serve contains less than the MCL of any contaminants. In practice, this does not always work so well. (See an example here.) But that is a different subject, I won't cover in this guide. Radium, as well as it's daughter radon, are naturally occurring elements found in uranium and thorium ores. Another major source for these radioactive pollutants is the waste from oil and gas industries. If radium is your main water problem, you have the choice between various methods to remove it from your water. If you already own a water filter, you can find out here if it likely to reduce the radium concentration in your water. 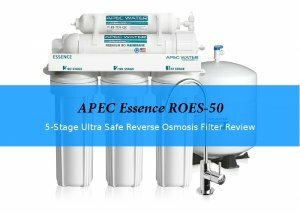 Reverse osmosis works by pushing the water through a semi-permeable membrane with small holes, that let water molecules pass through while bigger contaminants are held back. The membrane is flushed regularly to wash out the contaminants. And while this wastes water, it also eliminates the risk of radioactivity building up within the filter. A big plus for me, if I were to buy a new water filter for radium removal. The second option is cation exchange, a technique many water softeners use. Radium ions are ions with a positive charge like i.e. calcium and magnesium. The water flows through a bed of salt, where the positive charged ions are replaced by sodium ions. While this technique works well to soften water - and reduces the radium level in your water - there is a small risk of radium bypassing or radioactivity building up in the salt bed. On the other hand, the salt bed is regularly flushed to regenerate it. 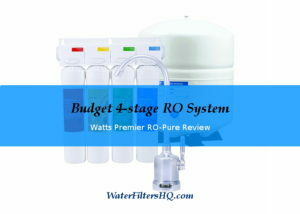 And having a water softener is better than no radium filter at all, but for me it would not be the first choice. Distillation, you probably know how that works from your science classes. Water is heated up, evaporates and the vapor is cooled down to liquefy again. Distillers need electricity to work. Apart from that, they are only feasible for smaller amounts of water due to the time it takes to heat up and cool down the water before you can drink it. That's why I decided, not to check them out further here. If you followed me so far, you noticed that I favor reverse osmosis filter systems for radium removal, and why. So lets take a look at water filters that are certified for radium removal. There are many other systems on the market, but as I can not test their effectiveness for this specific contaminant, I made a list of systems that are certified by NSF/ANSI standard 58 for their radium reduction claim. So RO systems can get certified, even if they where not tested for radium reduction. You have to look into each filters certificate individually, to find out if this test was done on a specific model or not. Which one you choose, depends mainly on your budget and the amount of water you need daily. They all are for out-of- sight, under sink installation. Hence looks don't matter, right? Another factor to consider is the amount of waste water produced, especially if you live in an area with water shortage. Recycling waste water by using it on your plants might be not such a good idea, as you would pour all the radium you removed from your drinking water into your garden. RAUßE, Christof, MJÖNES,Lars, HAGBERG, Nils, JAAKKOLA, Timo, LEHTO, Jukka, VAARAMAA, Kaisa, KELOKASKI, Pasi, RIEKKINEN, Iisa,EEVANNE, Heini, SCHÖNHOFER, Franz, KRALIK, Claudia, IRLWECK, Karl, KATZLBERGER, Christian. STUK-A169. Helsinki 2000.101pp. Health Risks of Radon and Other Internally Deposited Alpha-Emitters: Beir IV, National Research Council (US) Committee on the Biological Effects of Ionizing Radiations, Washington (DC): National Academies Press (US); 1988.